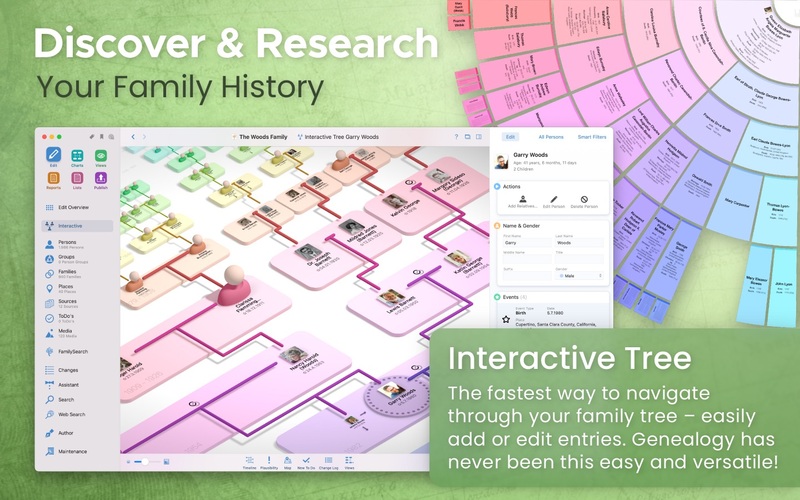 MacFamilyTree offers numerous options for you to capture and visualize your family history. Now matter how you want to illustrate your family relationships – MacFamilyTree 8 has the right solution for you, offering different types of reports, charts or the innovative Virtual Tree 3D view. The possibilities are nearly endless – optionally synchronize your data via iCloud, access a huge genealogical online archive to assist your research, create websites and family books or do your research on the go with MobileFamilyTree 8, available separately for iPhone, iPad, and iPod touch.